Well, this was bound to happen. As soon as one service comes along, namely Amazon's Now Prime, offering deliveries within one hour of ordering, suddenly everyone's jumping on the bandwagon. Well, okay, not quite everyone, but by the start of next year Amazon will be joined by San Francisco-based logistics company Postmates in the world of speedy London deliveries. 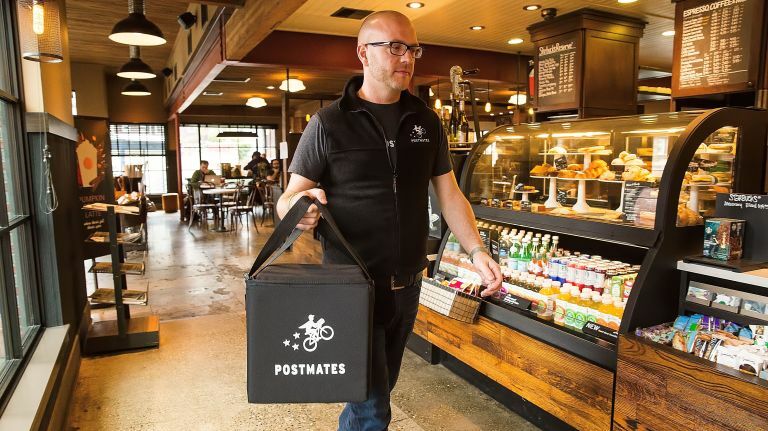 Postmates, a company that previously made headlines following its partnership with Starbucks to bring hot coffees straight to your door (no, really), has already been operating over in the States for some time and it's no turned its attention to the UK. So how does it all work? Well, you download the free Postmates app and browse all the stores and shops that use Postmates as a courier service (none have been confirmed yet but both Apple and Starbucks are just some of its clients in the US so expect iPhones and Cinnamon Lattes aplenty) - Postmates charges a delivery fee for its service (roughly 9% of your items is the current rate in the States) then whisks your order straight to your door. The company plans to launch its services in London from the second quarter of 2016.